Malacky is the center of the Záhorie region in western Slovakia. Jews settled here in the nineteenth century, and their number reached its peak in 1880, when the town had 397 Jewish residents. The first Jews probably came from Moravia, and the community later maintained economic and cultural ties with Vienna. After the Budapest Congress of 1868-1869, which formally split Hungarian Jewry, the Jews in Malacky opted for an independent Status Quo Ante community orientation. Acting as a seat of the rabbinate for 17 villages in the area, the Malacky Jewish community maintained the full range of religious institutions: synagogue, shechita [ritual slaughter], mikvah [ritual bath], school and cemetery. The two most important Jewish families in town were the Weinwurms and the Spitzers. The Spitzers were the main financial contributors to the construction of the synagogue and also donated the land on which it stands. The community had about 300 people before the Holocaust, but most of them were deported in 1942 to extermination camps in Poland, including Auschwitz and Majdanek. About 50 Jews lived in Malacky in 1948; the majority of them emigrated to Israel, but a small Jewish community carried on until the 1960s. No Jews live here today, and the cemetery is left devastated in the southern part of town. The synagogue is one of the most beautiful in Slovakia, a stunning monument to the Jewish community of Malacky. Designed by the Vienna-based architect Wilhelm Stiassny (1842-1910), it was built in 1900 on the site of a heavily damaged synagogue from 1887. The former synagogue, also designed by Stiassny, was destroyed by fire in 1899. 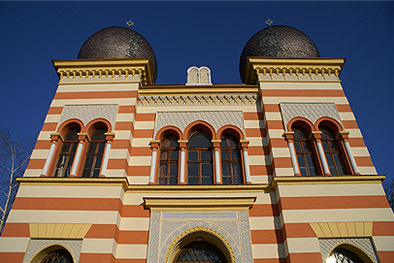 The synagogue is a fine example of Moorish-style architecture. Its two towers, horse-shoe arches, and typical red and yellow striping make it the most elaborate building in town. The former synagogue belongs today to the municipality and is used as an art school. Its large open interior was altered by splitting it into stories, though many original features were preserved. The ground floor, used as an artistic workshop, contains the cast-iron support columns of the women’s gallery as well as the original Ark. The upper floor serves as a concert hall with a stage that incorporates the ornate upper section of the Ark, under an exceptionally striking original wooden cassette ceiling. The synagogue originally stood within a typical Jewish neighborhood. This has totally disappeared and been replaced by modern structures.